Josh, Avery and I are moving into our beautiful home on July 17th in Knoxville, Tennessee. Our house is currently being built and getting the last minute touches on it before we move in. We are so in love with our house so I am sure I will be sharing lots of photos of it! 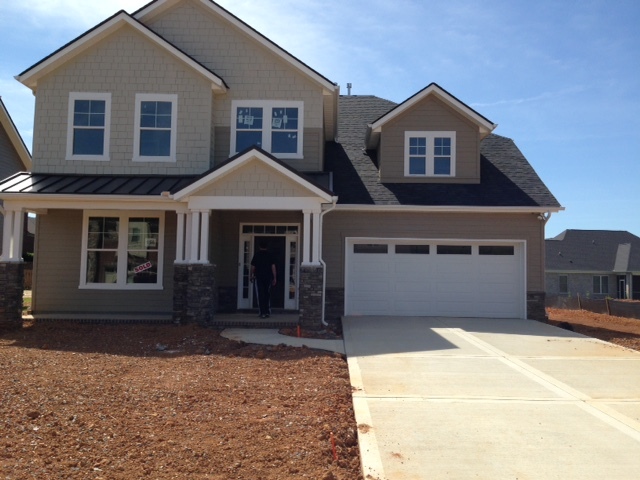 For now here are a few pictures that we have of the front, living room, kitchen and master bedroom. Hi I’m Cassy! Here is a little bit about myself. I am an 18 year old mother of the most beautiful, smart, and loving 1 year old in the world. I am engaged to her daddy Josh Willis who is 19 years old. He is the most amazing, caring, thoughtful and loving man I have ever met. He inspires, supports and loves me with all his heart. I know lots of girls say “I am the luckiest girl in the world” but I truly am the luckiest girl in the world to have such an amazing man by my side. We are getting married July 10th 2015 at Camas Meadows Golf Course and we are so excited! We are currently getting ready to make a life changing move to Knoxville, Tennessee and start our lives as a new married couple. Our life is everything but calm and quiet. Avery learns new things every day and keeps us on our toes. Besides being a mother my life consists of taking care of my family, doing crafts and DIY projects, organizing, and cleaning. I love lists and having a clean house which is at times a challenge with a toddler so I am learning to embrace the mess the best I can. I have always loved writing stories and reading other mom’s blogs so I decided to start my own blog and write about my life and everything in it. I may be just 18 but I am thrilled to take on the roles of a wife and mother! God has truly blessed my life and I love being able to share moments, helpful tips, and experiences with all of you.